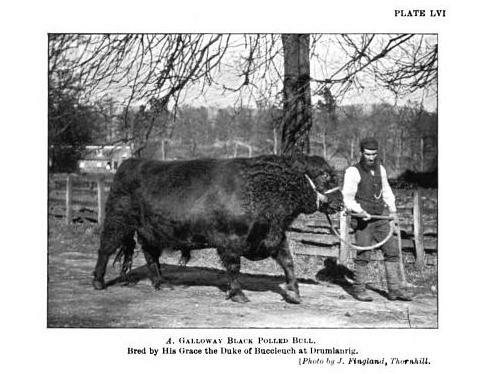 ﻿﻿﻿﻿﻿﻿﻿"Large are the treasures of oblivion. 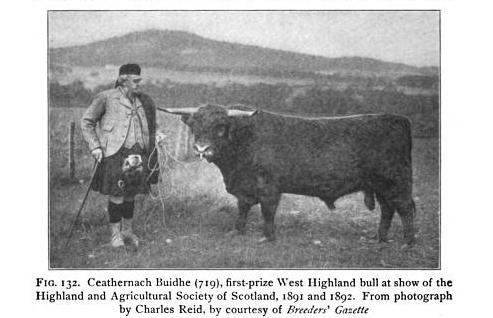 Much more is buried in silence than recorded." 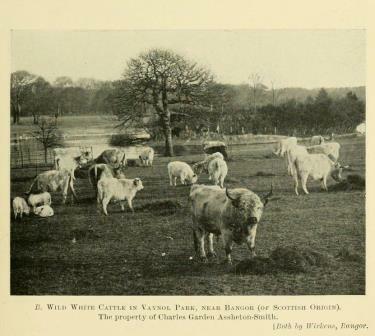 ROLE OF NATIVE SCOTCH CROSSES IN SHORTHORN "IMPROVEMENT"
The Anglo-Saxons brought red, "German" cattle to Great Britain and the Dutch brought large boned "flecked" cattle from Europe. 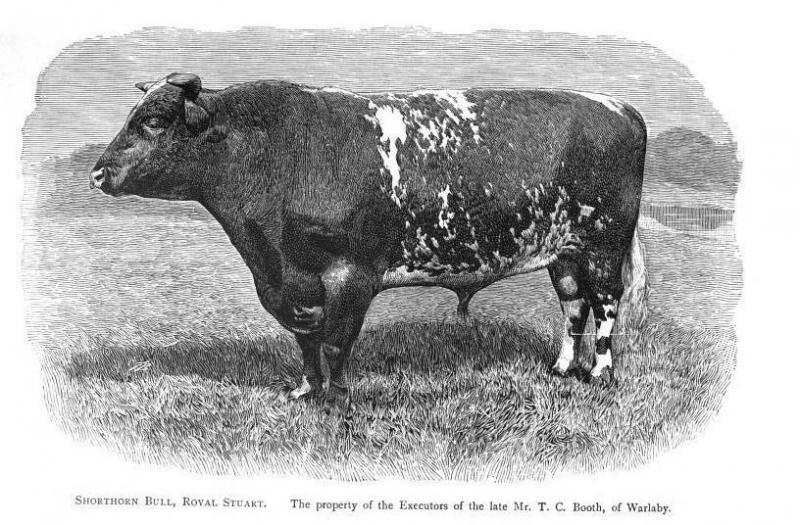 At the close of the eighteenth century, Teeswater Shorthorn cattle were "improved" to a beef type by the Colling brothers in England. 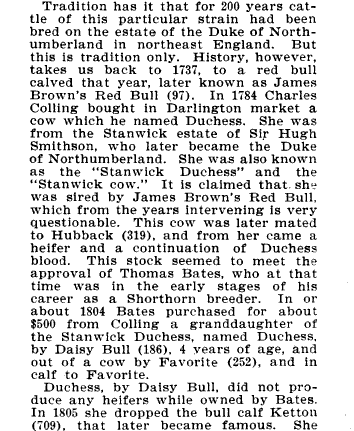 This improvement traces to the use of a bull named Hubback. 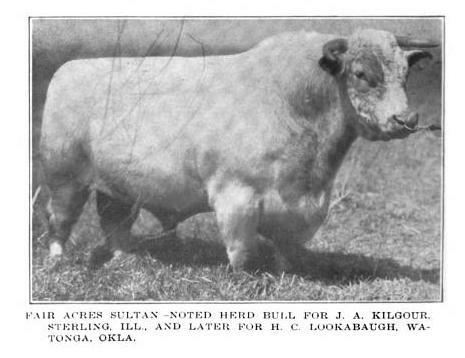 Hubback was a small yellow roan bull; short legged; wide chested and mossy haired. 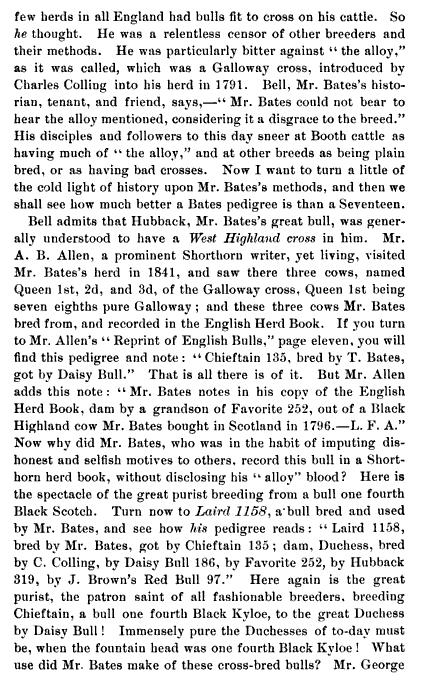 There was much speculation as to whether the dam of Hubback was part Kyloe, or West Highlander. 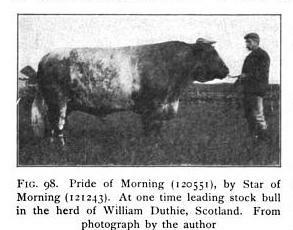 Purists vehemently denied Kyloe ancestry for Hubback, but all the "improved" shorthorns carried very Scotch traits. 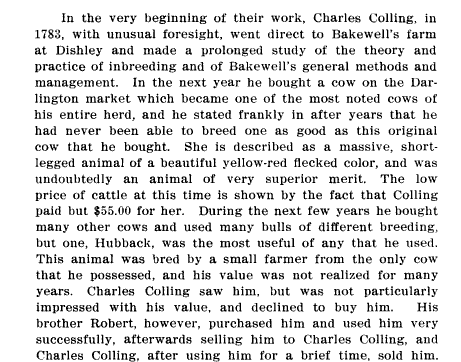 The Collings followed the selective breeding practices of Robert Bakewell to fix phenotypic characteristics into prepotent types. 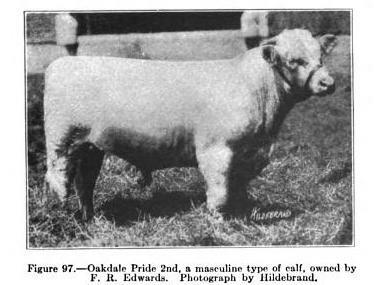 Hubback's body type was thus concentrated, through line breeding, into the Colling's breeding stock. 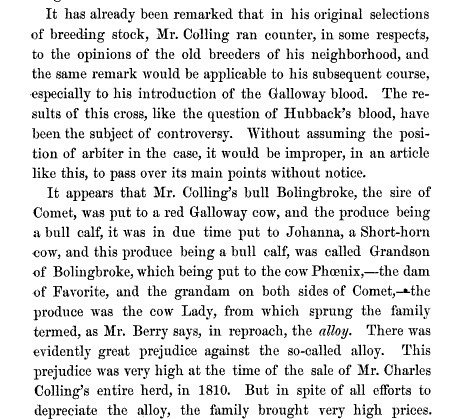 Thomas Bates and John Booth both used Colling's bulls in their Shorthorn herds. 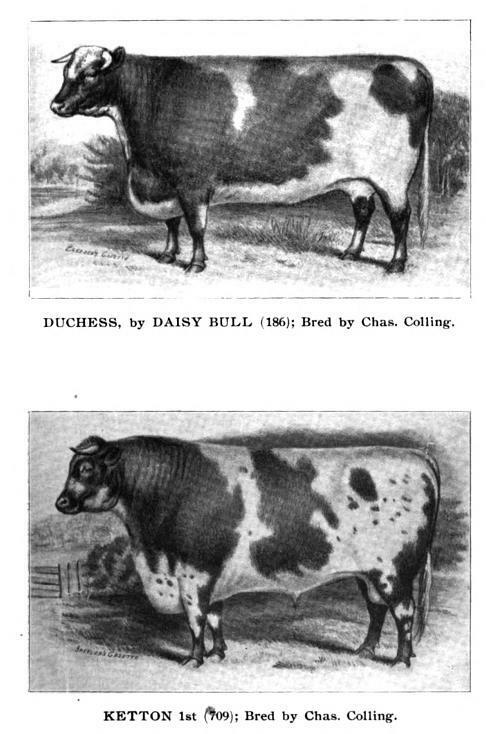 Thomas Bates cow Duchess by Daisy Bull, bought from Colling, was a granddaughter of the "yellowish-red, short legged, wide-backed" Duchess cow from Darlington market. 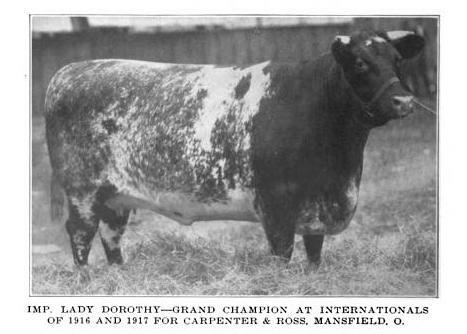 She was the mother of Duchess the 1st. 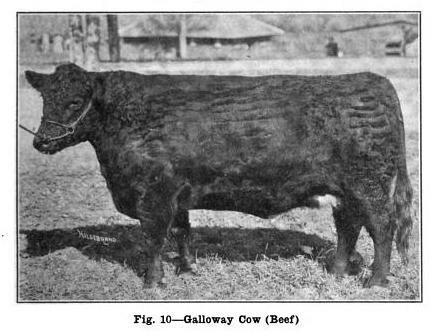 GALLOWAY CROSSES IN SHORTHORN "IMPROVEMENT"
Charles Colling's "Alloy" family of cattle was bred from a Galloway cross bull. 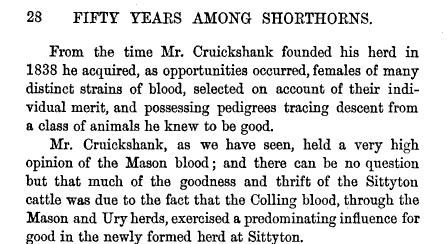 Purists disparaged the cross, but Alloy blood made it's way into many prestigious breeder's pastures. 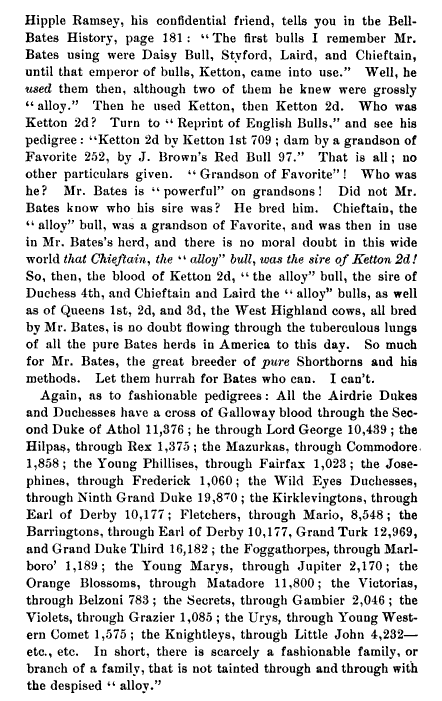 Bates was reputed to have used bulls with Black Kyloe crossed dams early in his career. 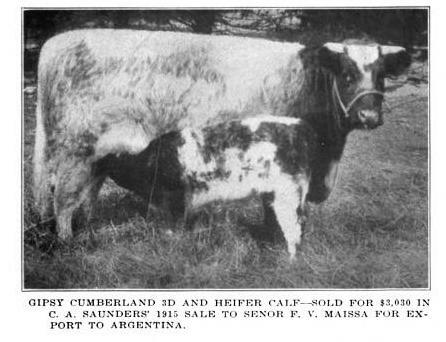 The following account is certainly emotionally charged, but it seems credible. 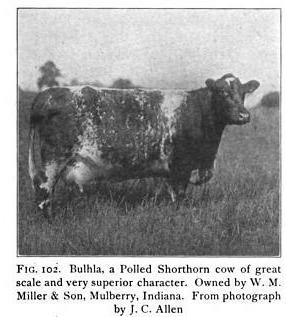 Eventually, English Shorthorn breeders began to compromise the vitality of many Shorthorn families through inbreeding. 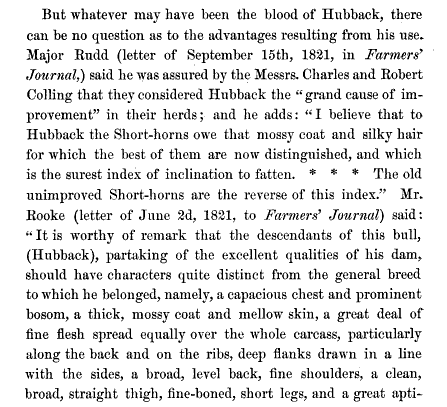 A conservative Scotch farmer, Cruickshank bred archetypal Scottish functionality back into his Shorthorns. 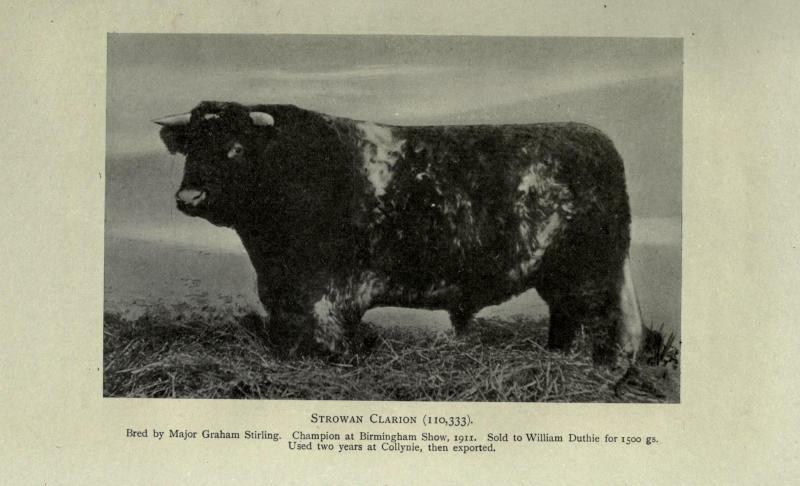 Evidently, Cruickshank also selected for the the characteristics of the old native Scotch breeds. 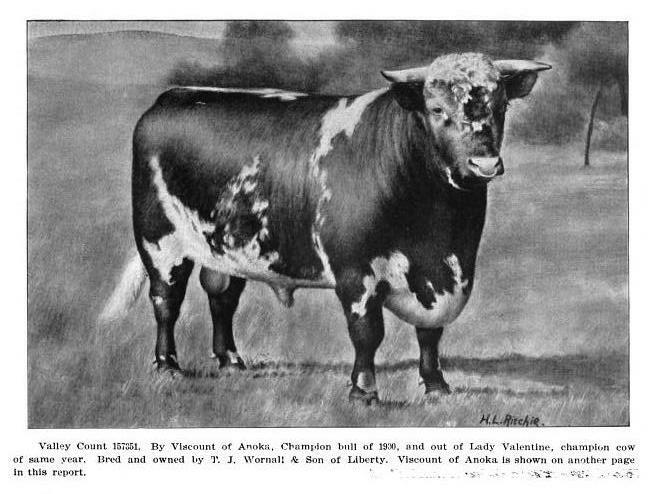 Breeding to suit his own ideas,Amos Cruickshank succeeded in restoring the constitution, longevity, deep flesh, early maturity and fattening qualities that had compromised the original Shorthorn improvements. 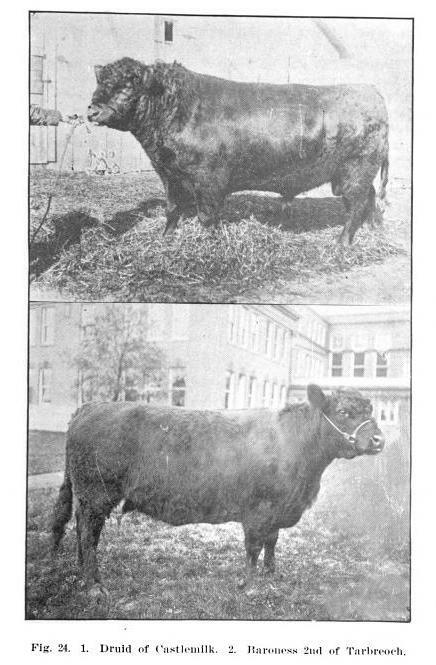 Copyright 2010 PUREGRASS BEEF. All rights reserved.